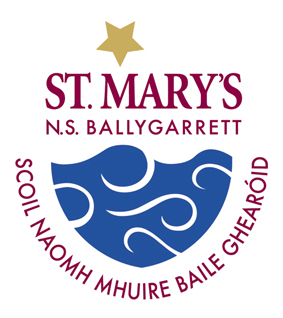 St. Mary’s National School is situated on a large two-acre site on the outskirts of Ballygarrett village. It was built as a four-teacher school in 1970 and replaced the old building in the village, which dated back to 1915. Due to expanding numbers the new school was extended in 1984 to accommodate five teachers. The school has had 3 other permanent classrooms added in recent years as well as a new stone front and canopy. Most of the windows in the school were replaced in July 2015 also. For the school year 2015–2016 we have 218 pupils attending our school. The school building consists of eight classrooms with adjoining toilet facilities, a General Purpose Room, two Learning Support Rooms, Resource Teacher Room, Computer Room, Principal’s office, Secretary’s office, Staffroom, adult toilets and an open Courtyard. Outside we have a fenced off basketball court, large tarmac playground, staff car-park, a playing pitch and other grass play areas. Our school is funded by the Department of Education and Skills.